Digital servos provide advantages over analog circuits when high positioning linearity is important or when control parameters need to be modified frequently. This could be the case when load changes occur or when different motion profiles need to be optimized for minimum settling time or optimum tracking accuracy. 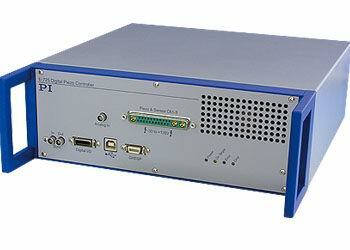 The E-727 is a high-performance digital nanopositioning controller for piezo stages with up to 3 axes. High-power amplifiers permit dynamic operation and scans even for piezo systems with high capacitance direct drives and large travel ranges. 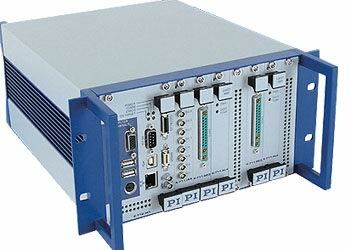 A powerful 32bit DSP processor ensures a servo rate of 20 kHz. Low Noise 24 bit DACs provide high position resolution. Digital I/O lines are available for triggering and synchronization with external events. Analog control inputs are optional. The ID chip feature enables automatic calibration and exchangeability between piezo mechanics and controllers. All Parameters Configurable in Software, Change of Settings "on-the-fly"
even during complex motion. The interface provides multiple ways to communicate with the E-712: from Ethernet and USB to parallel realtime control. In addition optional high-resolution analog I/O supports external analog sensor or control signals as well as driving external amplifiers.